Summary: a symposium on innovation, technology and later life provides confirmation that many of the challenges to making use of tech for ageing better are organisational and cultural as well as technical. We have plenty of tech – the issues are how to personalise and support use appropriate to people’s needs and situation. But ageing organisations can’t do that if they aren’t using social tech themselves. I found the SEEFA symposium last week on ‘Transforming not excluding – the impact of information technology and innovation on later life’ most useful because it didn’t focus on innovative technology. It was more of a high-level distillation of the sort of day-to-day conversations people are having in the field. However, it could have been even more useful with some additions, including fairly standard social tech. More on that later. SEEFA is the South East England Forum on Ageing, and the event was hosted in the Lords by Lord Filkin, who is chair of the Big Lottery Fund’s Centre for Ageing Better. Several score people, mainly in later life, were addressed by Baroness Sally Greengross and a good range of speakers with experience in industry, ageing, care and other fields. I was one of a panel asked to make a contribution, and there was a lively Q and A. The symposium was facilitated with an informal-yet-informed touch by Guardian public services editor David Brindle so that, unusually for this sort of event, if felt like a big, sensible conversation. I was particularly listening out for confirmation or otherwise of the ten provocations about innovation in Ageing Better that I posted recently, and the challenges I distilled from those for the Ageing Better exploration. You can also review key points yourself from the symposium, because John Popham declared #itlater the event hashtag and dived in to lead some tweeting and then created a Storify. Here’s my provocations, (enhanced with some comments I received). I’ve added points from the symposium discussion, and from people tweeting in response to the stream. See John’s Storify for attributions. 1. There isn’t an opt-out from technology – but you can choose how much you participate. (Technology has changed the world dramatically, and it will continue to change. What’s important is enabling people to choose how they engage). Why isn’t technology transforming people’s lives as much as it might? Are people aware of the potential? Technology is changing fast – you don’t have to be older to get out of date. People can feel more in control of their lives with appropriate technology – but tech makes things smaller and faster, which can be challenging. Social connectedness is a key determinant of personal well-being. Older people don’t want to be singled out – they want to be part of everything. 2. Government is concerned that many older people are not online – but there are limits to what government can do. (People will engage with what’s interesting and useful to them, and use devices that most suit their needs). Focus on the individual, their needs and interests. Focus on what tech can do – not what it is. There are distinct business benefits in connecting older people – however some businesses don’t want older customers who create problems. Everyone needs a reason to change, and changes to services could be the catalyst. Lack of basic education and literacy is still a barrier for many. 3. Everyone needs Internet access … but beyond that, no one size fits all. (Cost is a barrier, and then personalisation is important). The lack of rural connectivity continues to be a huge problem. Confirmation at the symposium about cost – or perceived cost – as a barrier to adoption, and the need for personalisation of devices and use. Be careful about language. “Older lady said she didn’t need “mobile banking” because her tablet never left the house”. 4. Computer courses and basic skills training don’t meet the needs of many older people. (Tablets are much easier to use than computers for most purposes, and smart phones and smart TVs may also meet many people’s needs). The digital skills needed for work are generally not the same as those needed for non-work entertainment, learning, communication. People working in organisations have tech “done for them”. It’s a shock to retire and find you have to do-it-yourself. Older people tend not to search Youtube for user guides. Printed manuals are still needed. 5. Simpler interfaces are needed for computers and mobile devices – not just more functions. (Older people should be involved in design). A lot of discussion about the need for co-design. Why are there no big new products for older people at the Consumer Electronics Show? A lot of support for “simpler”. Some people were urging inclusion of older people as users of the latest tech, while others favoured more simple, low-cost options. It’s probably not either-or – it depends on the individual, their situation and preference. Personalisation – not general dumbing down. 6. Relatively few organisations in the ageing field are actively engaged in the online world or using collaborative tools. (Using social technology should help enable greater greater cooperation). 7. Digital social innovations in services are not scaling. (There’s too much focus on the tech, and not enough on what it does, together with a lot of re-invention). There is much potential for using tech to help people in care lead a good life and connect with friends and family. Why not adopted more? 8. There is a raft of research, but little knowledge-sharing of that and day-to-day practice. (A lot of research is hidden and not transferred to practice. A culture of competitive tendering reduces people’s inclination to cooperate and use what’s already available). “Not invented here” is a huge barrier to adoption. Partisan discussion of issues and solutions doesn’t help. Need to break out of the silos. Much research and other knowledge is in formats that are unusable by practitioners – we need new knowledge products. 9. The energy for change lies with apps, connectors and storytellers. (To which we can add, evolution of trusted technologies such as TVs. Bring the storytellers together). The potential for using TV was one of the hot topics at the symposium, with recommendations for a number of devices. Tablets are increasingly proving more attractive than computers – but again depends on the individual and activity. 10. The digital divide is no longer a useful metaphor. Reality is more complex. I’ve mixed insights from the symposium into the exploration provocations partly for my own purposes, and partly to show how it is possible to build on existing knowledge. All of these points could be remixed into a different set of provocations – and you are welcome to do so. What’s now important, I think, is focusing on key challenges and developing ideas tro meet them. I’m trying that on the site hosting the exploration into innovation Ageing Better. When David Brindle called on me for a contribution at the symposium I said (expanded somewhat here) that when I was a mainstream reporter on the Evening Standard in the 1970s we had typewriters, hot metal type-setting and a cuttings-based library. Reporters were a crucial channel – if they did their job well – in transmitting what was new and innovative. Few people had access to a cuttings library. Newspapers and other publishers owned the technology. I noted as a reporter then, that we would see, in any field, a cycle of forgetting. Faces would change as people moved jobs, but the same stories would resurface as “news” every three or four years, if you checked in the library. Most people wouldn’t have a cuttings library, and so couldn’t know whether it was new or not – which was fine for a lazy reporter. But why is it that we see the same sort of thing today, when people have the means of research and publication on their smartphones? Why is so much publishing of newsletters and reports designed for the paper-based library, rather than a format that allows easy sharing? Why is research funded that duplicates past work? At the symposium there was no reference to the work of organisations like Nominet Trust and NESTA in this field, to sites like Connecting Care, or people like Shirley Ayres who do so much, often unpaid, to share experience in the field. I’ve gathered those and other references here. Funders and sponsors want organisations to demonstrate how their resources produced results. Collaboration could dilute that. Organisations want to promote their work and profile. Senior people in London-based organisations are more easily able to go to events and network with policy people and funders than people outside London. There’s not much incentive for the London circle to share. While social technology does not on its own enable cooperation and sharing, it makes it far more possible, and among those who use it engenders a culture for that. Most organisations, and their staff, in this field are trapped in old tech systems designed for a different age. Even if they want to use social tech they may not be able to. Of course there are lots of exceptions … but am I wrong? John Popham has recorded some heart-felt audio here on organisations and social tech. As I’ve said in this piece, I found the symposium very useful and interesting, and I was glad of the opportunity to contribute. Big thanks to Peter Dale and Julia Pride. It was impressive. However I don’t see how SEEFA – or any similar organisation – will be able to take their exploration into technology, innovation and older people to the next stage without more use of the technology themselves. If John Popham hadn’t committed time and expense to come to the event, and then act as a social reporter to declare a hashtag, lead the tweeting, and Storify the tweets, we would have to wait some weeks for a report. It might then not be in bit-sized pieces that can be shared. (I do the same sort of thing, but John is a better live-tweeter. He does great video too). There wouldn’t have been much external participation without contributions from Paul Webster and Shirley Ayres, creating content and alerting their networks as well as John’s and mine. So my friendly suggestion to SEEFA is this: before publishing a report of the symposium, no doubt including barriers to innovation, please start using the technology! SEEFA’s experience in doing that, together with some of members, would provide very valuable additional insights. Update: SEEFA have kindly invited me to talk to their executive about the technology challenges facing organisations. I think this will be a great opportunity for me to share some ideas – and also learn about the realities of running an organisation with volunteers and limited resources, in a fast-changing world. Exploration into innovation in Ageing Better including challenges and ideas forum. In my last few posts I’ve promoted the idea of more digital innovation in the Big Lottery Fund’s £82 million Ageing Better programme, and ways to share knowledge and experience both among the 15 local partners and more widely. Hall Aitken, referenced in the tweets, are the consultants providing support to the 15 partnerships, and last week ran an event for some of them to get together for the first time since receiving confirmation of funding. Earlier Shirley Ayres**, who perhaps does more than anyone to promote the use of social media and knowledge sharing in the field of social care and well being, tweeted about the event … “huge investment of public money affecting millions should be live streamed” … but to no avail that I could see. There were quite a few tweets, and I asked if there would be a round-up and report, but didn’t get any response. Earlier this week there were a lot of interesting tweets with the tag #wellbeingconference from Ecorys, who are also working on Ageing Better. It looked as if there could be useful cross-over. It is, of course, very welcome that Big Lottery Fund, consultants and others tweet from events … but it isn’t a substitute for well-curated resources and more organised ways to share knowledge. Unfortunately that wasn’t planned, as far as I know, with Ageing Better … but maybe there’s scope for a DIY approach rather than waiting for a central response. (I’ll also check with BIG whether something is now being planned). There is a need to explore the potential for developing a Community Wellbeing and Social Technology Innovation Hub which brings together all the organisations funding, researching and promoting digital technology innovations and pilots across the wider care sector. This could be an independent organisation or a new remit that falls to an existing one, however it could also be developed ‘from the ground up’ in a way that takes advantage of the very technology that it reports on. By supporting practitioners, researchers, funders and policy makers to share resources in ways that makes them highly discoverable, we could begin, now, to create this useful hub of knowledge. We could start simply by aggregating links using a shared twitter hashtag or social book-marking site (such as www.diigo.com); or we could look to bring together the available open source software (such as that which www.educationeye.org.uk is built upon) to bring together, catalogue and share this information as it is published. Either way (or indeed using a mixture of both), we need to create a better shared understanding of innovations in this sector. Invite those people to nominate others that they think would help share knowledge in the field. From this it will be possible to draw a first map of the ecosystem. Outline the idea of building a social ecosystem – as a simpler version of this paper – including the different elements: mapping, resource gathering, ideas generation, workshops, online activity etc. Invite commenting and participation – aim to find some champions. Look for opportunities to run workshops – and develop a DIY kit for running workshops. This would include a framework for workshop content, as above: people, organisations, activity, methods etc, and also for reporting the workshops. From the network, identify content curators and bloggers who will act as social reporters to help make sense of content, and share. At one or more points in this process, invite the emerging champions to face-to-face events to work out a vision of what we are trying to achieve, and who does what. Look for opportunities along the way: will someone fund continuing socialreporting/facilitation; another organisation convene events; existing interests in the field pick up different elements of the work. I’m using the term social ecosystem – or ecology – here as shorthand for the connected cloud of people and organisations, networks, content and tools that may be involved in sharing knowledge around a situation or topic, using a range of different media. The Living Lab is an evolving programme of workshops and online social reporting activities, led by David Wilcox and Drew Mackie, to explore how to use digital and other media in different settings – or ecosystems. In practice we often use a fictitious town called Slipham as the setting for the Lab, and then use insights to work “for real” on various projects. The people with different interests, motivations, experience, and disposition and skills. Some will have a wide network of relationships, some less; some will share ideas openly, others not. Organisations that may or may not have a culture of sharing, good or poor internal communications, hierarchical or networked structures. Content in different formats and media: ranging from books and essays to blog posts and tweets; highly structured or snippets; formal or informal. Types of exchange: conversational or formal; stories or documents. Platforms for sharing: big public systems like Google, Facebook and Twitter that provide the platform for much exchange; closed systems within organisations; self-hosted systems. Tools: social media and other tools that allow us to share content on platforms as well as face-to-face conversations, phone calls, paper-based communications, radio, TV. I’ll check out with a few people in the field – including Shirley – whether it is worth putting some effort into this approach. For a start I think we could achieve a lot with some simple network mapping, assisted by my colleague Drew Mackie, agreement on hashtags, and some simple curation of content. ** Here’s a round-up of some of Shirley’s work, Twitter account, and blog. 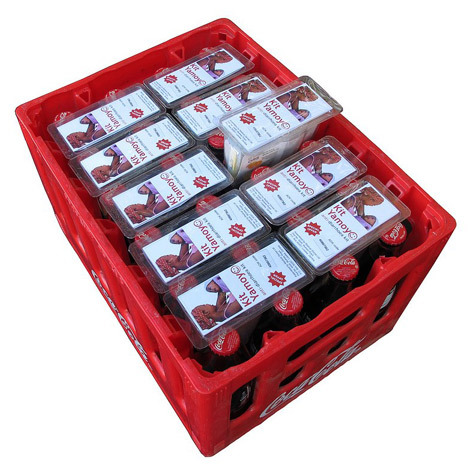 Simon Berry blogs a nuanced account of how Colalife is changing its award-winning package – originally designed to use spare space in CocaCola crates – to deliver medicines to poor mothers in isolated Zambian villages, and how this has been reported. His headline: Our learning journey so far and accusations of failure and abandonment. The original Colalife packs are still being produced, but a new design for Kit Yamoyo, under development, will not fit into the crates, because the real innovation turned out to be learning from Coke’s end-to-end value chain for distribution. As Simon says, the space was in the market, rather than the crates, and retailers were prepared to buy kits by the box-full. Coke crates were not the best way to get kits to the store. In the end, hardly any of our kits have been put into Coca-Cola crates. Instead, what has worked is copying Coca-Cola’s business techniques: create a desirable product, market it like mad, and put the product in a distribution system at a price so that everyone can make a profit. If there is demand and retailers can make a profit, then they will do anything to meet that demand. We will not be abandoning the current design. Mothers like it. In fact we are about make up another 20,000 kits using this format – however, if we remove the design constraint of the kits needing to fit in the crates then we can reduce the cost of the packaging considerably which will make our kit even more affordable and strengthen the all important value chain. However, when the change was reported, a couple of design magazines followed up with stories about failure and abandonment. Although the reports did deal with the value of learning from trials, the headline writers could not turn away from traditional mainstream news “values” to sell the piece. The headline messages were: “They thought they were smart, but they got it wrong”. “They won an award, then changed the design”. I recommend reading Simon’s piece in full as yet another example of openness and the sharing of experience in his reporting of the Colalife learning journey. I think he has taken the stories in good part, and by blogging a full explanation ensures that the reports become another part of the learning journey. That’s a good lesson in innovation reporting: tell your own story, honestly. I’m looking forward to the premier of the The Cola Road document that tells that story in detail, at the RSA on September 23. Details here, including a trailer. I hope to grab an update interview with Simon. My earlier Colalife reports here. Congratulations to Lucy Hooberman on her appointment at Warwick Digital lab as the new Director of Digital Innovation from December. Lucy wrote an interesting blog about innovations in her work at BBC’s Future Media & Technology Division. Collaboration needs real pay-offs. Where does tech best fit? In recent posts I’ve looked at two models for collaborative social innovation: Social Innovation Camp and RSA Networks. In the SI Camp model people pitch project ideas openly, collaborate within newly-formed project teams, then compete against each other. In RSA Networks people pitch ideas, look for collaborators, and may also get some help from RSA staff. Both are, in part, about the use of social technology, but my analysis of them both – compared here – brings home, I hope, that technology is not the key element for success. What’s important is the underlying model for moving from idea to implementation, and reward. Jemima Gibbons from David Wilcox on Vimeo. We are moving from a simple world to a rich, complex, diverse one. One where power is less centralized and more distributed. We are moving from a command and control world to a world where people can do as they please within the boundaries of responsibility. David summarised World 1.0 and World 2.0 in the chart below. This is the world of both small-scale social innovation – and also new-style open, corporate innovation supported by NESTA Connect. It looks as if we’ll have a socially innovative autumn in London, with more opportunities and support for people wanting to do good stuff using new (tech) stuff. Here’s what I’ve picked up recently, and I’m sure I’ve missed a lot, so please add a comment with other events and activities you may know about. This round-up rather shamelessly favours my friends. Social innovation is happening: will Government join in?